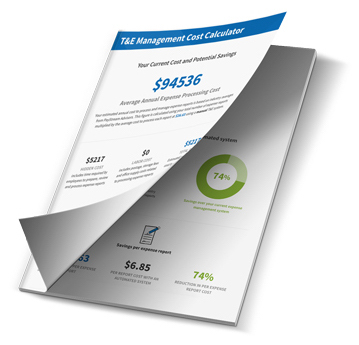 Thanks for completing your T&E management cost assessment. We're excited to share your results with you! Please complete the information below so we can email your complimentary report right away. Your information and results will be kept confidential. First: Help us learn about your organization's expense reporting needs. Which process best describes your current expense management system? How many employees are in your company/organization? On average, how many of your employees file expense reports per month? On average, how many expense reports does your company processes per month? What integrations would your company use? What is your average postage cost per report to mail expense reports from employee to manager to accountant (FedEx, USPS, UPS)? What is your annual cost of storage for expense reports, receipts and documentation tied to expense management for auditing purposes? Estimated annual amount spent on office supplies tied to expense management (paper,staples,ink,etc.)? Estimated annual cost of non-compliant expenses (e.g. augmented mileage, missing receipts, out of policy transactions, miscategorization, fraud)? On average, organizations using a manual process report a 50% compliance rate. Those on a semi-automated process report a 77% compliance rate. Estimated annual cost of delinquent credit card payment fees? What is the average number of hours per month the acccountant/manager spends manually reviewing expense reports, receipts and credit card statements to enforce or review policy violations? If your organization remains on your current process, do you anticipate a need for an additional accountant to help with expense processing?